After living in a country that is totally 'isolated' from the rest of the world, I find it very difficult to comprehend that the Causeway linking Johor, Malaysia and Singapore is practically in my back yard (I live in Woodlands). I am only a stone's throw from a whole other country. The following is all the information and history I could gather on the Causeway. 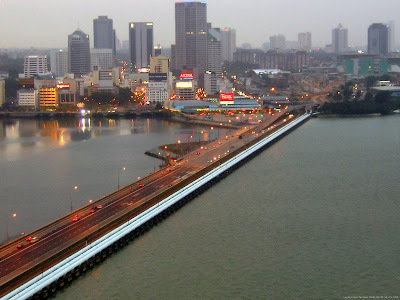 The Johor-Singapore Causeway (Malay: Tambak Johor) is a 1,056 metre causeway that links the city of Johor Bahru in Malaysia across the Straits of Johor to the town of Woodlands in Singapore. It serves as a road, rail, and pedestrian link, as well as water piping into Singapore. The causeway connects to the Skudai Highway (Federal Route 1) on the Malaysian side and the Bukit Timah Expressway on the Singaporean side. It carries 60,000 vehicles on a typical day, with particularly bad traffic congestion on the eve of public holidays. 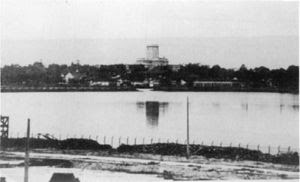 The Johor-Singapore Causeway was completed in 1923 after four years of construction. It was partially severed in 1942 during the Second World War, to prevent the Japanese army from invading Singapore. However, it was rebuilt once the Japanese had captured Singapore. During the 1964 Race Riots, the causeway was closed from 22 to 26 July, 1964. 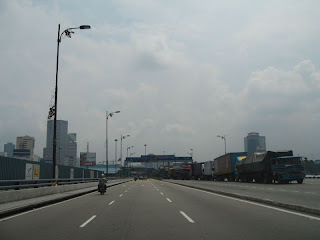 The Johor-Singapore Causeway is the first land link between Peninsular Malaysia and Singapore. The second, called the Malaysia-Singapore Second Link, was completed in 1998. The new Woodlands Checkpoint, built partially on reclaimed land, was opened in 1999 to accommodate the increasing traffic flow and the soot which had enveloped the old customs complex over the years. The old road leading to the causeway was diverted. The old customs complex, built in the early 1970s, at the junction between Woodlands Road and Woodlands Centre Road closed after the new checkpoint was opened in July 1999, although the motorcycle lane remained opened in the morning until 2001. The new Woodlands Checkpoint also houses the facility for clearing train passengers into Singapore (the Woodlands Train Checkpoint), which was previously at Tanjong Pagar railway station. The relocating of train immigration facility to Woodlands caused disputes between the two countries. There were several calls by Malaysians to remove the Causeway. The first call occurred in the Johor state legislative council when the speaker said the Causeway was "more a hindrance than anything else" while a port should be built close to Johor Bahru to rejuvenate the city's economy. The state of Johor currently already has developed ports including Pasir Gudang and Tanjong Pelapas. The second demand came in 1986 when Israeli President Chaim Herzog visited Singapore. At that time Singapore government was criticised by Malaysian politicians and the press for allowing his visit. Under the former Mahathir administration, the Malaysian government scheduled to build a new customs, immigration and quarantine complex on a hilltop near the Johor Bahru railway station. A bridge is planned to link the new customs complex with the city square. The project was named "Gerbang Selatan Bersepadu" (Integrated Southern Gateway) by the government. The project was awarded to a construction company, Gerbang Perdana. During the construction, one of the two underpass channels located at the end of the old customs complex has been blocked. Roads exiting from the old customs complex have been diverted. The design envisages a re-direction of traffic flow to the new customs complex after the completion of the proposed new bridge to Singapore. The old customs complex will be torn down once the new customs complex begins operation. All this time no agreement had been reached with the Singapore government on replacing the causeway with a proposed new bridge. 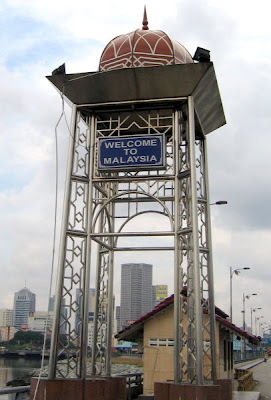 In January 2006, Malaysia unilaterally announced that it is going ahead to build the new bridge on the Malaysian side, now referred to as scenic bridge. The construction of the new scenic bridge on Malaysian side officially began on 10 March 2006 when the pilling works of this bridge was completed, but on 12 April 2006, construction was halted and scrapped by Mahathir's successor, Abdullah Ahmad Badawi, with growing complications in both negotiation (the conditions set by Singapore were strongly opposed by the people of Malaysia on grounds of national sovereignty) and legal matters with Singapore. Most recently, Badawi has said that "in [the] future, there won't be just one or two bridges between Malaysia and Singapore. There will be lots", renewing hope of further improvements in transportation links between the two countries. In early November 2006, the Sultan of Johor called for the demolition of the bridge, reasoning that the Causeway is undermining the state economy. Some Malaysians and many Singaporeans feel that the causeway already serves the purpose of linking Singapore and Malaysia and there is already a bridge known as the Second Link between Tuas in Singapore and Gelang Patah in south-western Johor state. Some Malaysians and Singaporeans cynically think the only purpose of having a bridge to replace the causeway is if some Malaysian businessmen and politicians might somehow personally benefit financially or politically and have dubbed the proposed scenic bridge "the cynic's bridge". The lack of transparency and public accountability on public projects in Malaysia and the enormous wealth of some Malaysian businessmen and politicians only fuels their views. Some people expect the new bridge to carry a future high-speed rail line or rail line for a Maglev train service between the two countries and a future extension of Singapore's MRT (mass rapid transit) line into the first MRT station at Johor Bahru but no official mention has been made on these possibilities which remain on the wish lists of many citizens on both sides. Since there does not appear to be any agreement between the two governments on these two potential rail links and on other bilateral issues, there is no likelihood of the causeway being replaced by any type of bridge, straight or scenic, in the near future. Two lanes are designated for cars and motorcycles heading for Singapore. A third lane was designated for buses and a fourth lane was designated for trucks and lorries. Similarly, two lanes are designated for cars and motorcycles entering Malaysia. A third lane was designated for trucks. Photography and recording is not permitted in most parts of the custom premises from both sides, especially Singapore. Correction of the offence would mean surrendering the used film to the ICA or deleting the images from the digital camera. At the Singaporean (entering) side, LED screens direct cars into four separate lanes, and within the four lanes that leads into the customs complex, numerous counters are allocated to check the passenger's passports. This sector is termed "primary clearance." Motorcycles are directed to one main channel. This applies to buses entering Singapore, where they will have to enter via another separate channel. Cars carrying taxable goods are directed to the red channel to declare their goods and make payments at a nearby counter. Cars not carrying any taxable goods are allowed to proceed to the green channel, and it is mandatory for cars to proceed to the customs officers check centre. This sector is termed "secondary clearance". This requires at least one passenger to alight from the car. Parking lots are used to accommodate these cars. If clear, the car will proceed to a customs officers check centre. The officer-in-charge has the right to search the goods in the passenger car. Suspicious persons are directed to drive to a nearby station for a dog check. This requires the removal of all items for a security check, while at the same time, dogs are used to detect if the car contained any smuggled goods or drugs. Once cleared, the vehicle is directed onto the ramp which leads to the Bukit Timah Expressway or Woodlands Centre Road. Singapore's law requires that every Singaporean-registered vehicle leaving Singapore must have at least a three-quarters full gas tank, due to the fact that the Singapore Government wanted to discourage Singaporeans from going over to Johor simply to buy cheaper petrol, although in the past a half tank of gas was sufficient. Foreign-registered cars are exempted from this requirement. All vehicles have the option to enter the customs complex either through the Bukit Timah Expressway or Woodlands Centre Road. Passenger cars entering via Woodlands Centre Road are directed into four channels; cars at Bukit Timah Expressway would encounter problems in driving as two lanes would merge somewhere along the viaduct leading to the customs complex. Cars are then directed to drive-thru windows at immigration to have their passports inspected. If clear, cars will drive towards the sector where officers might be seen checking the gas gauge in every Singaporean-registered car. Cars will then enter the causeway. Cars entering Malaysia are separated into two categories: car with a person in it and car with two or more persons. The former will go to a small, right-hand side section of the complex while the latter will be directed to the large portion of the complex. Buses carrying passengers will alight at the right-most corner of the complex. Vans and other goods vehicles are channeled up a slope leading to the Tanjung Puteri complex above the custom complex meant for cars. Passenger cars leaving Malaysia only require their passports to be checked. Cars are directed to counters where their passports are to be checked before they are permitted to proceed to the causeway. Malaysians, who are permitted to hold restricted passports (only valid for entering Singapore) until December 31, 2005, were only required to show the passport to the customs officer at the counter. A new law was introduced in 2003 to stop issuing restricted passports to all Malaysians. This requires Malaysians travelling to Singapore to hold an international passport, a rule that was once optional. Singaporeans once held similar passports as with the Malaysians until 2000. Traffic jam may measure up to 1.5km along Woodlands Centre Road during peak hours. Vehicles heading towards the customs complex via the Bukit Timah Expressway may encounter the similar situation. Travelling by public bus service across the causeway takes about thirty to forty-five minutes, while the travelling time for other vehicles are between one hour and two hours. Vehicles will have to pay toll charges at both sides of the causeway. The toll plaza at the Malaysian side is operated by PLUS Expressway Berhad. In Singapore, VEP charges apply to cars and motorcycles who have utilised the 10-VEP free days. Note: Touch 'n Go are also available at all PLUS toll booth of the Johor Causeway Checkpoint. 1.^ Vans/Light Goods Vehicles are defined as those having two axles or six wheels or less. The Vehicle Entry Permit (VEP) Scheme was introduced in 1973 to regulate the entry of foreign-registered cars into Singapore. This scheme was eventually extended to foreign-registered motorcycles in 1992. During the 1980s, foreign-registered cars were allowed up to twenty five days of VEP-free days on weekdays and Saturdays from 2 a.m. to 3 p.m.. These cars will then have to pay the VEP after the days were fully utilised. A VEP slip at that time consist of a coloured, patterned paper which was stuck to the windshield. Each VEP was valid for a day. Since the 1990s, cars and motorcycles had to display a coloured paper on their dashboards stating the date of entry. Such permits were only valid on weekdays between 7 p.m. to 2 a.m., Saturdays after 3 p.m. and the entire Sundays and Singapore's Public Holidays. Cars and motorcycles were also allowed five days of free-entry for each calendar year into Singapore during peak hours during weekdays (including Saturday and eve of public holidays before 3 p.m.). Such a move was to control traffic flow in Singapore by restricting foreign-registered from entering Singapore. In 2000, the Land Transport Authority decided to cease issuing multi-coloured Vehicle Entry Permits printed on cars and motorcycles. Instead, coupons were issued and distributed to foreign-registered vehicles entering Singapore; vehicles entering via the Johor Causeway will receive a purple ticket with the LTA logo printed on it. A similar green ticket was issued and distributed for foreign-registered vehicles entering via the Second Link at Tuas. Drivers will have to pay for the ticket as toll charges. These coupons were issued in 1999 but co-existed with the Vehicle Entry Permit until it phased out on March 31, 2000. At the same time, the five-day free entry scheme for foreign-registered vehicles entering Singapore during peak hours in Singapore was abolished. However, such ticketing system was later abolished and the Autopass Card System was introduced. Drivers will have to slot in their cards into an In-Vehicle Unit or (IU) machine which deduct the toll charges the drivers will have to pay. However, toll charges are automatically deducted via the IU machine when the vehicle leaves Singapore. All foreign-registered vehicles entering Singapore are only granted free entry on weekends and during the off-peak hours on weekdays (5 p.m.-2 a.m.), although toll charges have to be paid, which varies from vehicle. Cars and motorcycles entering Singapore during peak hours during weekdays had to pay Vehicle Entry Permit fees. In January 2005, with the implementation of the five-day work week, foreign-registered cars are exempted of VEP charges for entire Saturdays, instead of exempting VEP charges only after 3 p.m. on Saturdays. Exemption of VEP charges on Sundays and Singapore's Public Holidays still apply. The Land Transport Authority announced on June 1, 2005, foreign-registered cars and motorcycles are permitted to drive into Singapore for ten days in a calendar year without paying Vehicle Entry Permit fees, although toll charges still apply. After the 10-Vehicle Entry Permit free days have been utillised, drivers will have to pay the prevailing VEP fees for subsequent days if they continue to use or drive their vehicles into Singapore. Such charges apply to cars and motorcycles who leave their vehicles in Singapore during weekdays between 2 a.m. to 5 p.m.. However, during the Singapore mid-year and year-end school holidays, VEP fees will only apply from 2 a.m. to 12 p.m.. In the same year, the government increased the toll charges of cars (S$1 to S$1.20 for cars entering via Causeway, S$3.50 to S$3.70 for cars entering via Second link) and other vehicles. Vehicle Entry Permit Charges for cars was lowered from thirty dollars to twenty dollars. VEPs can also be purchased on a monthly basis at S$600 for cars and S$80 for motorcycles. Image 1: The Johor-Singapore Causeway across the Straits of Johor facing towards Singapore. 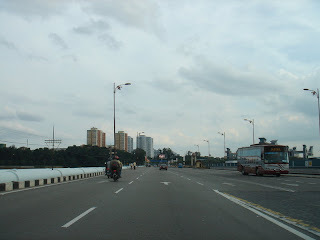 Image 2: The same causeway facing towards Johor Bahru. Image 3: The severed causeway on the eve of Japanese invasion in 1942.